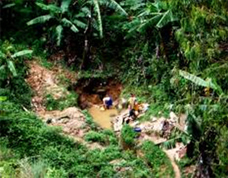 Because it is a process that is rather simple and inexpensive that has been used since forever and makes it possible to obtain pure water, nearby and relatively easy access, and most often free of charge. 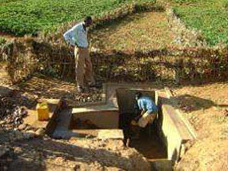 The catchment of springs can also be more elaborate and associated with the construction of a mini-network for water distribution serving via gravity one or several villages that are far from the catchment site. 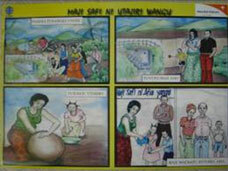 These are mostly inhabitants of rural mountain villages or underprivileged areas. Recall (see Fact Sheet "Simple spring catchment and arrangement") that there are 3 main methods for the catchment and arrangement of a spring : the simplest method, another if a reservoir needs to be added, and that via drainage. The choice for the method depends on the characteristics of the spring (location, flow, extent, consumption to be satisfied). If its emergence is very precisely located and not deep (less than 2m) and if the planned consumption is less than the flow of the spring, the simplest method will be used. 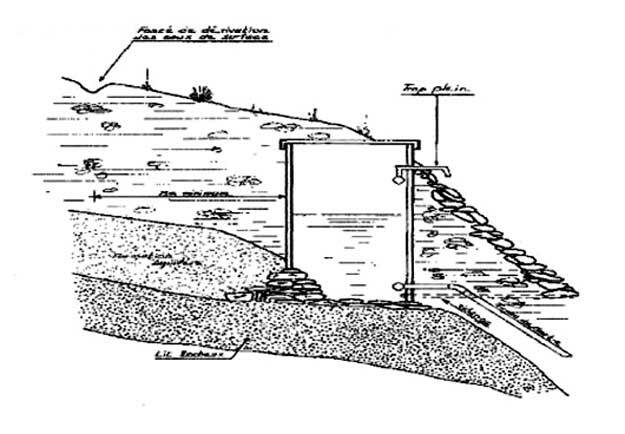 If a similar case is encountered but with a flow that is less than that needed for consumption, a reservoir must also be built (with or without prior filtration). Finally, if the emergence of the spring is diffuse or deep for example in wet or swampy land, drainage must be provided upstream of the spring. It can be applied only if the spring emerges easily on its own with a sufficient flow. 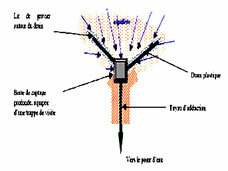 This method is used, either when the flow of the spring is too low to supply the population permanently (or a network to which it has been connected) with the quantity of water required, or when it is desired to recover for other purposes (for example irrigating neighbouring crops) the water which is not used at certain times of the day or night. Two techniques can be used according to the quality of the water collected. 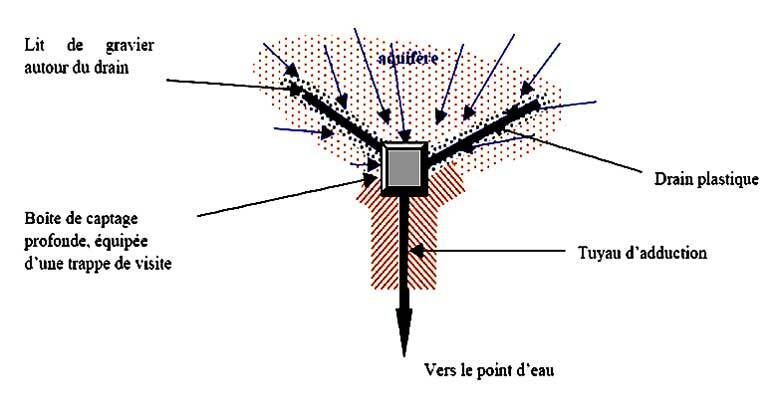 When the water is pure (majority of the cases) a structure for the catchment of the spring is created similar to the previous one but by replacing the capture box with a reservoir. 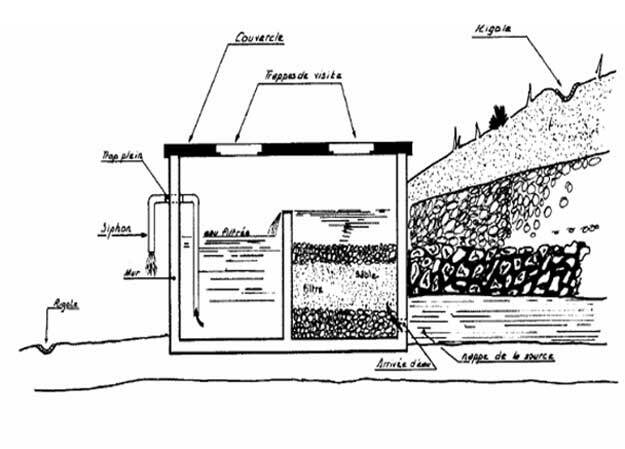 When the water has to be treated beforehand, the method is the same as the previous method but the reservoir includes two compartments of which one contains a filter comprised of gravel and sand. The water penetrates through it, flows up through all of the layers of gravel and sand and flows after filtering from the other side of the wall. It is then drained via a siphon or sent into a network. This is used when the spring emergence zone is wide and diffuse, which often gives the land a swampy appearance. 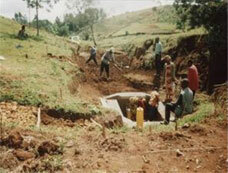 Catchment for the water must then be accomplished by using several drains. These drains are perforated buried ducts making it possible to capture the water from an aquifer via simple gravity. These are most often prefabricated but can be produced easily right on the site using PVC pipes by sawing them partially of by perforating them and by closing one of the ends by melting it. They can also be made from pottery or rocks. 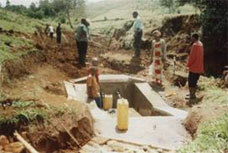 Note that such drains are sometimes also installed in order to increase the capacity of a simple collection basin. The diffuse water present in the land then tends to flow naturally via gravity towards the drain. The drains carry the water to the spring capture box. 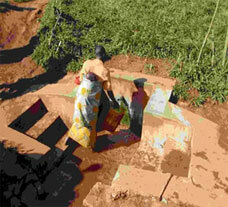 Installed in the trenches, they collect the water that flows there in order to carry it to this capture box. Arranged in a suitable way in order to capture a maximum of streams of water, they are installed right on the trench on beds of gravel if the water is not too muddy. On the contrary, they are fully covered with a layer of gravel, which is preferably cleaned and calibrated, by about twenty centimetres which will provide a sort of filtering and as such improve the quality of the draining. The whole is covered with a protective filtering fabric of the geotextile type or with a woven synthetic fabric. Sand can also be inserted between the gravel and the fabric of the sand in order to avoid tearing the fabric and in order to have increasingly narrow interstices between the gravel and the geotextile, which improves filtering. The whole is recovered with soil. The water is as such collected in the capture box which has to be large enough to be visited and to be cleaned. It is finally carried to the exit via a pipe. - The level of water in the collection basin must always be under the level of emergence of the spring before the beginning of the work, otherwise the water from the spring will no longer be able to be collected. It is therefore more prudent to also provide an overflow pipe at the exit for the basin. - Hygiene awareness and information campaigns should be provided for the population and the latter should be closely involved in choosing, creating and in monitoring the spring. 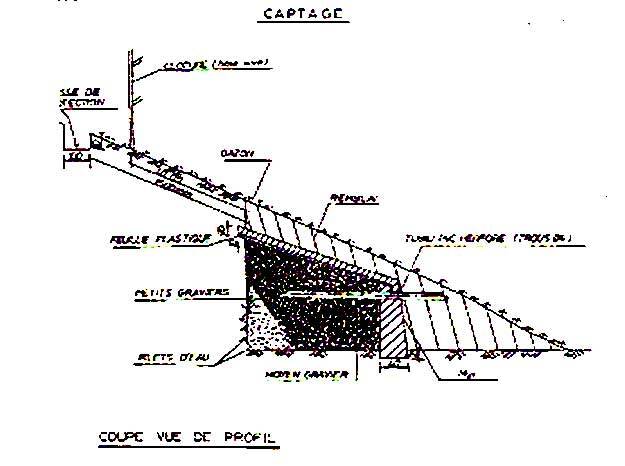 - A prior study of the land must be carried out very carefully in order to determine the location of the trenches, their depth, and the type of drainage to be carried out (if the area is very large, several T or Y drain systems must be considered that exit into the same capture box). 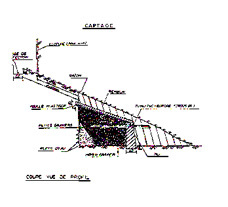 - Drainage entirely modifies the land on which it is set up. Indeed, the land on the surface that was once soaked with water becomes dry through the drawdown of the aquifer and a modification takes place in the landscape and in the vegetation that the surrounding populations must be made aware of. 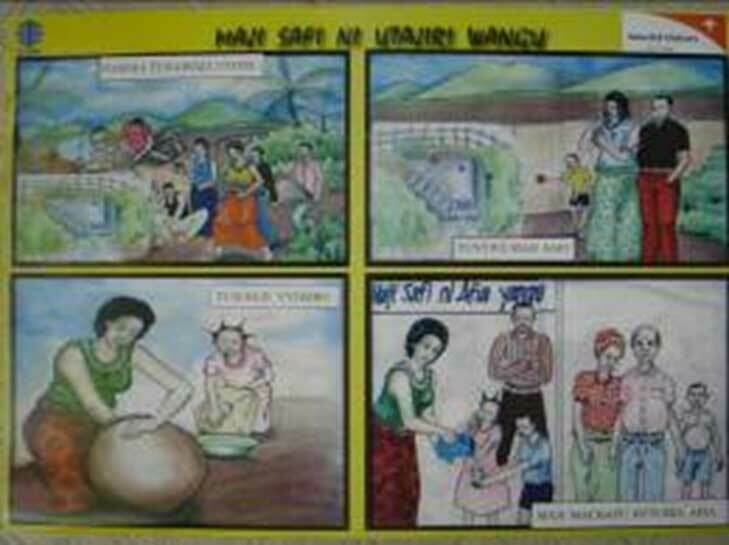 The water points used are often traditional supply points that are known to the population (no change in habits, facility and safety of use). 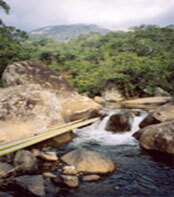 - The flow of the spring can be irregular or seasonal. - Substantial expertise is required for the work and the cost is higher. - Regular maintenance of the site must be planned and there is a change to the landscape. The cost varies according to the location and the characteristics of the spring. 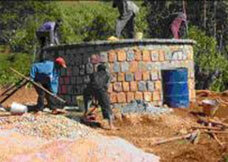 Recall that in the case of simple catchment, this costs varies in general from €600 to €800 in Africa. Constructing a reservoir can increase this price by half and draining can double it or even more than double it according to the quality of the land. With a mini-network for distribution via gravity of about ten km, this cost is obviously much higher and can reach €20,000 to €40,000. Action against hunger : "Water - Sanitation – Hygiene for populations at risk", a 745-page very complete work published by Hermann 6 rue de la Sorbonne 75 006 Paris (€50) that explains and illustrates the various techniques used by AAH and of which pages 343 to 357 cover spring catchment and arrangement.